One day, there was a squash that was convinced it was a spaghetti and started to behave like one. The good think is, it had all the properties of a vegetable, because truly it was one, so very low in calories, but could be substitute to spaghetti dish being dressed like one. What I like about this squash, it’s that it can be served in its own skin and makes quite an original presentation. This time I served this in a plate. Squash is quite blend, so it needs to be spiced up a little, with chili, garlic or anything that will enhance its natural flavor. Pre-heat oven at 400F, cut the squash lengthwise and wrap in aluminum foil or parchment paper, make sure to wrap it with enough paper so no air gets into the squash. It needs to be well sealed. Place squash in the oven for about one hour or so, turning it in both sides so it gets well cooked. Make sure not to over cook it either, it needs to be scooped out of his shell with spaghetti type of strings, if it’s over cooked, it will get all mushy and watery and you won’t be able to get spaghetti strands out of it. Besides you won’t be able to use the skin as a serving dish. 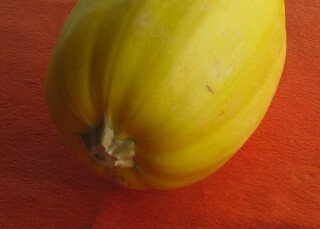 When the squash is cooked, remove from foil, remove the seeds, scoop the flesh and place in a mixing bow and set aside. In the meantime, while the squash is cooking, heat a pan with olive oil, add crushed garlic, stir for one minute or so, add the basil, stir for another additional minute, making sure not to burn the garlic, then add the chopped tomatoes and chili powder, salt and pepper. Cook for about 20 minutes at low heat until the water has evaporated. When tomato sauce is cooked, pour over the squash and heat up, stirring in a pan at high heat for one minute or so to mix all the ingredients together. 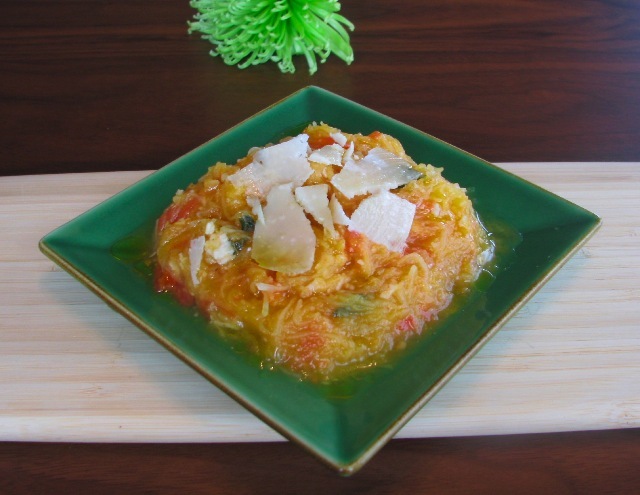 Place the squash in its shell, add parmesan, sprinkle with a little bit of olive oil, and some chopped basil. Serve hot. This entry was posted by silvia on December 20, 2008 at 1:36 pm, and is filed under Vegetables. Follow any responses to this post through RSS 2.0.You can leave a response or trackback from your own site.